Duporth Beach is a pleasant long sand and pebble beach with rock pools at low tide. There are no facilities or parking, so the beach is usually quiet. Signs warn of risk of cliff falls. See Beach Safety Guide. Duporth is reached from the coast path from Porthpean (10 minutes walking) or Charlestown (15 minutes walking). The coast path is steep in places. From the coast path there are steps which link up with the residents path to the beach, which has recently been rebuilt in concrete after a landslide. Dogs are allowed on Duporth Beach all year. 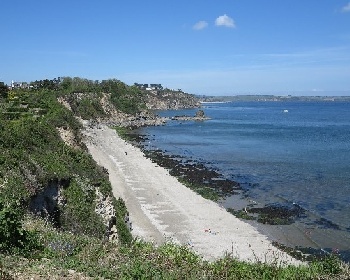 Duporth is close to St Austell. Approach St Austell on the A390 from east or west and drive round the outskirts of St Austell. Between ASDA and the Mount Charles roundabout on the A390 turn onto Porthpean Road, this is signposted to Porthpean and Du Porth. Proceed on this road and take the second left which leads down to Porthpean Beach. Park here and take the coast path to Duporth Beach, taking about 10 minutes. Alternatively park at Charlestown. No parking. Park at Porthpean or Charlestown. No. Toilets are at Porthpean or Charlestown.